This single pole wall switch from Aube allows you to take control of the lights around your home or building. It has two operating modes for maximum control and energy savings. In manual mode, it operates in the same way a standard light switch does. With a press, the lights either go on or turn off. In automatic mode, the lights turn on and off automatically based on the programmed schedule settings. Up to 7 on/off schedules can be set, and each schedule may run either for a single day or daily. 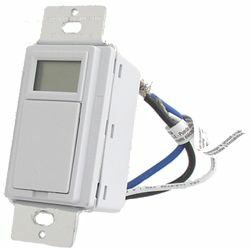 The programmable switch is a decora style, and does not come with a wall plate. It comes in white. Settings will remain, even during a power outage. Dimensions: 43 mm x 68 mm x 40 mm, 1.8" x 2.7" x 1.6"